We’ve done considerable talking about telescope mounts over the last several months, muchachos. But I don’t believe we’ve quite cut to the chase, to the heart of the matter, to the thing that affects imaging and viewing at least as much, if not more than, polar alignment. 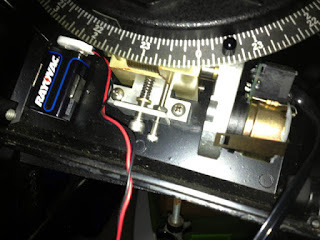 I am talking about the telescope mount’s drive, a.k.a. “clock drive,” as we used to call it back in the dark ages. Where have we been with mount motors and gears over the last five decades? Where are we going? What’s good, what’s bad? Let’s start out at ground zero. While telescope drive types can differ wildly, ranging from AC motor-driven spur gears to computer-controlled DC servo or stepper motors, their main function is always to allow a telescope to track the stars. Or, more properly, to counter the Earth’s rotation. However they do it, their role in life is to move the scope so it follows the natural procession of the stars at the “sidereal rate,” which matches the time it takes the sky globe to make one full rotation, 23-hours, 56-minutes, and 4-seconds (no, the esteemed Miss Franklin, my First Grade teacher, was not exactly right when she told us younguns the world turns once every 24-hours). That is only the first of two requirements. And it may be enough for some folks, those whose only goal is to observe visually at relatively low magnifications. A few dollars and a few gears, motors, and odds and ends and almost any equatorially mounted telescope can be made to track the stars acceptably well. But not necessarily well enough to keep a target dead still in the field for a camera. Motors? Gears? Hell, you don’t even need to go that far. Back in the 1980s there was a brief vogue for the “hiss drive.” Air released from a small inner tube (if’n you kids know what that is), “powered” the drive. As air ran out, the inner tube deflated and the scope riding on it tilted to the west to track the stars. Believe it or not, this Rube Goldberg contraption actually worked, and you could even vary the “sidereal rate” by changing the amount of air being released from the inner tube's valve. Course, the “hiss” in “hiss drive” would drive you bugs well before the night was through. When you are after that second requirement, when you want considerably more precision than can be offered by inner tubes or even simple gears and motors, that’s when things become sticky. Alas, that stickiness is unavoidable if you need a drive system accurate enough for astrophotography. The usual sticking point is not so much the motor as it is the gears. In the relatively small sizes practical for amateur-class mounts, they must be very accurately made. Even the tiniest imperfection will cause the telescope to, in effect, speed up or slow down, to exhibit “periodic error,” a back and forth east-west motion that will cause the dreaded star trails. With enough money, it’s possible to produce gears good enough to do the job. However, you do not need perfection. What is necessary is only a drive good enough to deliver round stars with guiding. 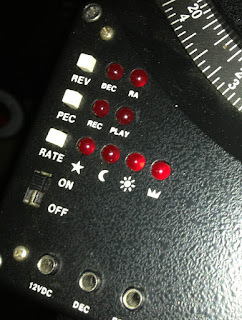 The drive must have a slow and small enough periodic error—maybe a back and forth motion of 30-arc seconds or less—that will allow either a camera and computer or a human hand on a set of hand paddle buttons to “guide out” the periodic error, to speed up or slow down the drive a little bit to counteract the back and forth error and keep a guide star in the crosshairs. If the periodic error is too large or too fast or happens at random instead of in periodic fashion, either computer or person will be unable to keep up, resulting in dadgum off-round stars in the image. Where to begin the clock drive story? Why in the 1960s, of course, amateur astronomy’s first big (commercial) gear boom. Most amateurs’ scopes then were un-driven, or at least human driven—like Unk’s pipe mount home brew 6-inch—but it was becoming more common for all but the most basic store-bought telescopes to come with a right ascension drive. While the Rodster considered these clock drives the highest of high tech, they were hardly that. Most drives were equipped with simple synchronous AC motors. Motors just like in an electric clock. The gears these motors drove were chosen so as to at least approximate that 23-hours, 56-minutes, 4-seconds sidereal rate. What kind of gears were they? They were usually simple spur gears, which means their teeth were cut straight rather than at an angle as in helical gears. What else? That was freaking it. You plugged in the drive to mains AC to track and unplugged it to stop. While some clock drives had automatic clutches that allowed you to move the scope by hand without undoing the drive gears, quite a few required you to manually disengage the drive motor before doing so. How well did these things work? Tolerably well. The problem wasn’t so much the spur gears, which can do a pretty good job, but the way the gears were set up. The mesh was often fairly loose, meaning that when you turned on the drive or stopped moving the scope it took quite a while for the drive to “catch.” You could try meshing the gears more closely, but lack of precision in the shafts they were mounted to and the alignment of those shafts usually meant you encountered binding and stalling at some point in the gears’ travel. Nevertheless these AC spur drives worked right well for visual observing. Some of these prole scope drives were a little better than others. 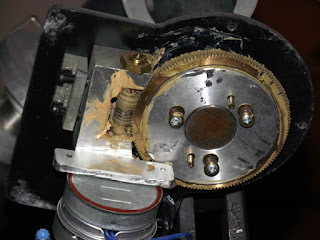 The clock drive on my revered Criterion RV-6 Dynascope, for example, has a worm gear (more on that in a minute, but a worm often yields better accuracy). Most of all, the RV-6 had Criterion’s legendary Dyna-matic clutch. It was a simple thing, a clutch made from a cork disk, but it worked oh-so-well. When you wanted to move the telescope, you grabbed the tube and moved it, it moved smoothly, and when you stopped the drive kicked back in with only a little backlash delay. The clock drive on my Dynascope still works well for visual observing and even for high power planetary observing. But that is visual observing. Imaging, deep sky astrophotography, is another steaming kettle of fish. Again, the problem with the simple AC synchro drives wasn’t those motors, but the everything else. For starters, you needed a way to guide the beasts. When Unk got his first Newtonian with a drive, a nice Cave 8-inch, he figgered the road to taking pictures like the ones Evered Kreimer shot for “A Messier Album” was wide open. Seemed simple enough: mount camera on telescope, focus on a bright star, find M13 (not so easy with a dim Yashica SLR viewfinder, but doable), open shutter and…hop back inside to watch Charlie’s Angels. After a half hour or so of enjoying Miss Farrah's adventures, run back out and close the shutter. Ha! As all but the greenest of greenhorns know, what young Unk got for his trouble was star trails. Unless you’ve got a mount approaching the best pro equipment in size and quality, you can’t just open the shutter and expose for half an hour. Or even five minutes. You have to guide. The problem was how to do that with an AC drive. What you needed to adjust a synchro motor's drive speed by small increments was a thing called a “drive corrector,” a special sort of inverter, a device that takes DC from a battery and converts it to AC. The only way to increase or decrease the speed of a synchro motor is by varying the frequency of the AC current powering it. A drive corrector was an inverter whose output frequency could be changed a little up or down from the standard U.S. 60 Hz. Hook drive corrector to battery, plug the telescope drive’s line-cord into the corrector, and watch a guide star (usually with a separate guide scope piggybacked on the main tube; Unk used a cast-off 50mm Tasco refractor he found at the Little Rock flea market), and make speed corrections with buttons (or a knob) on a hand controller, a “hand paddle” as we called it in them days, hooked to the drive corrector. Not exactly an elegant solution, but it worked and was probably not the weak link. The weak links were slow film and long Newtonian tubes that were almost impossible to balance and which were capable of overwhelming even the largest mounts. But we persevered, with Unk getting a few shots of M13 and M42 that didn’t look quite like custard pies. Of course we all wanted that elusive More Better Gooder drive-wise. Surprisingly, that did not come from the darlings of 1970s amateur astronomy, Celestron. Oh, the short and relatively light tubes of their SCTs did help, but their clock drives were pretty much the same as always: AC motors driving spur gears. As I done said, spur gears can be OK; decently made ones exhibit surprisingly low periodic error. Unfortunately, they are prone to that random error. Which can be a killer for astrophotography. Pore old Unk is at the guiding eyepiece half drowsing over M15 after half an hour of exposing. He’s gotten pretty good at anticipating his C8’s periodic back and forths. But, wouldn’t you know it? Suddenly and unexpectedly the guide star takes a big random jump, which the Rodster stares at in horror for too long before mashing the buttons to move the star back into the crosshairs. Result? A ruined picture caused by random gear error. The cure was a worm gear drive. A worm gear is a screw-like affair that has a big advantage: it keeps more teeth in contact with the gear it is driving than a spur gear can. That results in a smoother drive, one that still suffers from periodic error, sure, but is far less prone to random excursions. Who brought worm gears to amateur astronomy in a big way? John Diebel’s little kitchen table company, Meade. Meade didn’t stay kitchen-table long after 1980. The 2080 SCT that it debuted that year not only had purty good optics, if not quite as good as those of the C8, its drive made the Celestron’s seem like yesterday’s news. The 2080, you see, featured a worm gear drive, which Meade naturally trumpeted to high heaven in their ads. The company has always been prone to hyperbole in their advertising, but this was one time they weren’t; the 2080’s drive system really was better, and Celestron was soon playing catchup with its worm driven Super C8. Not that either Meade’s or Celestron’s More Better Gooder has ever been perfect. For one thing, most of their drive systems have not really been optimized. Worm gear systems work best when both the driving and driven gears have helically cut teeth, teeth cut at an angle rather than straight like spur gear teeth, as they are in most Meade and Celestron mounts. Nevertheless, SCT worm gear drives were a pretty big improvement. Now, if we could just get past lugging a 12-volt marine batteries and inverters into the field. How about the other telescopes, the non-SCT telescopes, of the day? To tell the truth, by the mid-80s there weren’t many left in use by astrophotographers, and those GEM Newts and GEM refractors that were hanging on were purty much the same as in the 60s and 70s: some had worms, most had spurs, almost all had AC drives. A huge change in drives, at least in SCT drives, came in the latter part of the 1980s, when we began seeing a few telescopes that allowed you to leave the drive corrector, if not the deep cycle battery, at home. 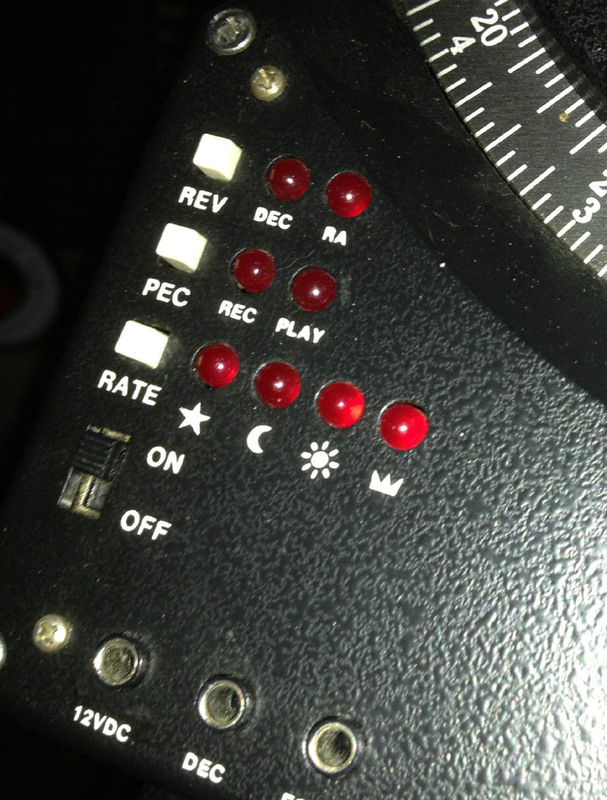 The transition to DC drives was a slow one, and the first SCTs powered by DC were actually AC clock drive scopes equipped with built-in drive correctors. This was a perfectly respectable way to approach the problem, and Celestron carried the idea to its logical conclusion with its initial Ultima SCTs, which not only had built-in drive correctors, but which were powered by internal rechargeable batteries instead of a 50 pound lead-acid job. Non fork mount SCT drives? German equatorial mounts, GEMs, were going DC, too, really DC in their case. I’m not talking about the teeny-tiny AA battery powered drive motors occasionally sold with Tascos and Jasons, but those of amateur-grade German mounts like the Vixens, which Celestron had begun importing from Japan. They and some other GEM manufacturers still offered AC drives for the right ascension axis, but the Vixen rigs with dual axis drives and a hand controller used actual DC motors powered by D cell batteries. Frankly, that’s probably where we’d still be at now, built in drive correctors for fork mounts and DC servo motor drives for the GEMs, if not for one huge change as the 1990s began: the triumph of go-to for SCTs. That turned the apple cart upside down, starting with the types of motors used. AC synchros, which were useless for go-to, were out. DC motors, either servos or high-tech stepper motors from them new-fangled dot matrix computer printers, were in. This is probably a good time to talk servo versus stepper motors. Which is better? Depends on who you talk to. One thing is sure, they are completely different in operation. Servos spin in continuous fashion like any other motor, steppers step along, moving in small increments. At first, servos were undeniably better. Steppers in scopes from the 1990s usually work OK, but at high magnifications, you can see them stepping along, with your image of Jupiter vibrating slightly but annoyingly. So a servo is the way to go? Not necessarily. Not now. The steppers’ high-power “vibration” has been cured in modern micro-stepper motors, with them moving in increments way too small to cause that problem. Steppers do have some advantages. They are easy to control with computers and, unlike servos, will not burn out if stalled. Bottom line? Both steppers and servos work well as scope drive motors. What else changed with the advent of telescope computers? The addition of an ever increasing number of drive features and options—everything from an incredible array of slewing and guiding rates, to dead-on go-to, to “automatic” polar alignment like Celestron’s AllStar—that computers made possible. It wasn’t all to the good, however. After a few brief years of experiencing the joy of powering my telescope for night after night with a single 9-volt transistor radio battery, I was suddenly lugging big old 12-volt batteries around again. Computers and go-to drives were and are power hungry enough that we are back where we started in that regard. And so we come to today. How are things? Things are very good drive-wise. I find it amusing, for example, when my fellow amateurs on the dadburn Cloudy Nights dismiss a mount that has—horrors!—a periodic error of 30-arc seconds. As recently as the 1990s, a mount with that kind of accuracy was considered amazingly good. What has caused the improvement? The gears on lower-priced mounts are probably better than ever, but what really helped was the addition of electronics and computers. That began just before the amateur astronomy computer revolution of the early 1990s, in the late 1980s with the advent of Periodic Error Correction, PEC, which was first brought to mass produced telescopes by Celestron. It was a simple idea. Guide your telescope like always using its hand control, keeping a guide star centered in the crosshairs, but record those corrections and, after you finished guiding for one revolution of the worm (or spur) gear, play them back for the rest of the observing run. PEC recording, which required a few computer chips, but not a whole computer, really, really worked. It would not free you from having to guide, usually, but it reduced the number and magnitude of corrections you had to make. You could afford to nod-off at the guiding eyepiece briefly, or even look up for a minute and have a drink of water (or whatever). Applying PEC to even a poor drive can dramatically improve its performance if its gear error is all/mostly of the periodic rather than random persuasion. I have, for example, seen PEC training improve a Meade fork mount drive with an error of over 50-seconds to the point where it could even do limited unguided imaging. Certainly I ain’t saying there are no telescope drive systems today that are mechanically superb. There are, and there are probably more of them available than ever. Like the ones on Astro-Physics mounts. The AP Mach 1, 900, and their even larger brethren are flat out amazing when it comes to tracking accuracy. They may not have as much going on in the computer department as some of the lower-priced spread, but, man, talk about smooth with incredibly low periodic error. And if you do want the computer glitz to the max, there are things like Big Red from Software Bisque. The Paramount GEMs, the MX and the ME, not only have tracking good enough to compete with the APs, they have every computer feature and gimcrack you can imagine. If you’d told me back in the early 1990s that in less than two decades the average amateur (well, the average amateur willing to spend as much on a mount as on a Kia automobile) could aspire to controlling a telescope over the Internet from anywhere in the world, I would have had a good old belly laugh. But that is indeed how it is with the Bisque mounts. And it’s not just the Bisques and the APs. Even mid-grade GEMs like those from Losmandy are both mechanically and electronically amazing. Maybe the most wonderful thing? The electronics/computer (but not mechanical) features of the top-of-the-line tend to migrate down to the Synta-Meade-Celestron level in a right quick hurry lately. Even more amazingly, things even run the other way, with features like Celestron’s computer hand control polar alignment routine, which allows you to do a polar alignment good enough for casual imaging just by pushing a few buttons on the HC and twiddling a couple of bolts, popping up in some of the higher priced GEMs. What do I expect to see in the way of clock drives—“computer drives” now, I reckon—in the near future? One big thing I expect to see is integrated pointing and guiding solutions like Meade’s currently troubled StarLock system. A combination of cameras and computers figures out where the telescope is pointing, where it should be pointing, and guides full time when the scope arrives at where it ort ta be. I hope Meade is now on the way to making this work right, but if they don’t, someone else will. Can I be honest, muchachos? I would no more give up my modern go-to drive systems than flying to the Moon. B-U-T…on those increasingly frequent occasions when I just want to do a little relaxing visual observing and pull out my RV-6 or my (mutant) Celestron Ultima 8, I gotta admit it is dang nice not to worry about computers and alignments and just plug in my humble CLOCK drive and go. No mention of ASA's experiment into direct drive? I've seen a lot of 10+ minute unguided subs at focal lengths up to 2000mm with perfectly round stars. I've been hearing about things like that for years, but have never yet got my hands on any results. Your humble reporter will only bring you stuff he's personally broken--err..."used"... LOL!